Under a freeway overpass in the waterfront district of Southeast Portland seems like an unlikely place to find hip hop. But through a nondescript industrial door, into a battered warehouse building, then up a flight of dingy stairs and past dark entryways is a room overloaded with vibrant colors, motion, music, and laughter. The walls are emblazoned with graffiti, a rotating gallery of street art. On a small elevated stage, an artist furiously applies paint to canvas. Breakdancers twist their bodies into shapes that defy both anatomy and gravity. Onstage, a DJ rocking oversize neon-orange headphones and an old-school navy blue Adidas warm-up jacket pushes her dark bangs out of her eyes as she switches records. In the audience, a group of ten middle schoolaged Somali girls in hijab clump together, watching the moves of Uneak, a breaker and yoga instructor. He slows his motions down so they can follow, and soon a line of girls is moving to the pulsating beat, their smiles as bright as the art on the wall. This is the monthly Zulu Jam, hosted by the Oregon chapter of the Universal Zulu Nation at their Salmon Street Studios warehouse space. Here hip hop is more than a musical genre; it is a culture and a community. Some critics feel that mainstream, commercial hip hop culture is full of violence, drugs, materialism, and misogyny; that it destroys rather than builds community. But since hip hop's inception in the South Bronx forty years ago, community has always been core to the culture. The United Nations said as much in 2001 when it recognized hip hop as an international culture and signed the Hip Hop Declaration of Peace. In fact, Hart credits hip hop with being a culture and community for those who are actively working to improve society. “In an increasingly dumbed-down world which progressively gets more passive and accepting of social and political rhetoric, belonging to a hip hop community has helped me keep my head above the water,” she says. A global industry grossing $600 million, hip hop accounts for sixty million US album sales annually. Hip hop artist Toni Hill says hip hop's money-making power “has influenced the runways of the fashion industry. It dominates the airways, and it sells everything from burgers to cars. Hip hop has Cookie Monster and Elmo rapping to the beat.” Hip hop was even used heavily in the 2004 elections as a tool to recruit young people to vote. The community's youth, most of whom were Black, decided that rather than die, they would give birth to a new culture. So they created ways, according to Chang, to dance on the edge of the apocalypse. The four elements of hip hop—DJing, breakdancing, emceeing, and graffiti—were all about making something out of nothing. DJs couldn't afford music lessons, so they grabbed their moms' turntables and old records and started scratching. Most of the breakdancers from the South Bronx couldn't attend Juilliard to study dance, but they were able to make a street corner their stage. “I am hip hop,” Muhammad declares. Toni Hill sees hip hop as a force uniting a diverse community: “My posse consists of college grads to street-corner thugs, block brothers to mothers raising their young. We are coming from different nationalities, colors, cultures, and creeds, but we share in a movement.” Hill has vowed to raise her infant son in a hip hop community; she's already brought him to the Zulu Jam. For emcee Mic Crenshaw, the Zulu Jam embodies the best of Portland hip hop's past. “I think there is a purity and a hunger that is present—not in all the hip hop music, but in a lot of it here,” he says. Crenshaw has been part of half a dozen different hip hop groups in the past fifteen years, including the seminal band Hungry Mob. “We had a small scene, so people have had to work together,” he says. “We were more effective being cooperative than completely competitive. Portland's scene was so small at the beginning, some say there were only two people in town with four-track recorders for producing songs, and well-known emcees Vursatyl and Cool Nutz both attended the same summer camp. It was in this close-knit community, says Vursatyl, that hip hop became his life. DJ and emcee Pete Miser agrees, describing the 1980s as an exciting and experimental time in the development of Portland hip hop: “There wasn't an older generation to tell us what to do or how to do it, so we were all inventing it for ourselves.” Miser, who now lives in New York, admits that not everything they created was good or original music, but it laid the foundation for later success. Miser eventually became the front man for the band Five Fingers of Funk, a groundbreaking live hip hop band that kicked the door open for hip hop in Portland's larger music venues. Because of the foundation laid by legendary Portland hip hoppers such as U-Krew, Dynamic Sound Machine, Bosko, Doc Rock, DJ Chill, Cool Nutz, Lifesavas, Five Fingers, Hungry Mob, and more, the 1990s saw hip hop go from incubation to full exposure, where hip hop artists were making enough money to support themselves. The Portland hip hop scene's closeness, its relative small size, and its underground nature might well be by-products of the segregation that Miser describes. Darrell Millner, a Black studies professor at Portland State University, says Oregon was established by the Civil War generation as a white homeland where Blacks were not welcome. This is evidenced by Oregon's founding constitution, which forbade Black people from living in the state, under threat of public whipping. “That clearly had a lot to do with the nature and the dynamics of early Black experience, the notion of excluding Blacks from the area. We haven't outlived that—to this day, it still has an impact on Blacks in Oregon and the Pacific Northwest,” Millner says. But despite the prevalence of legal and extralegal racism (Ku Klux Klan members numbered in the hundreds of thousands, and even won seats in the state legislature), the Black population exploded during World War II as Southern Blacks moved to the region to work in war production. In 1915, Portland's Black population numbered only two thousand; by 1943, it had swelled to twenty-five thousand. This contributed to a vibrant and raucous jazz scene, centered in North Portland's North Williams Avenue, the heart of the city's Black community. Clubs would stay open night and day, and you could find all nature of entertainment options. Everyone from Nat King Cole, Lionel Hampton, and Art Tatum played in that golden era when Black artists knew by word of mouth that Portland was the place to be. Racism and discrimination are present in any conversation about hip hop, a culture pioneered by poor, Black, inner-city teens, now embraced and practiced globally by almost every race and ethnicity. Here in Portland, a city with an overwhelming white majority, hip hop audiences often don't reflect those who founded the culture. Vursatyl says this disparity mirrors the larger music industry, where hip hop artists of color have a fan base that is 80 percent White. Many in the hip hop community have taken up this challenge. The annual Portland Oregon Hip Hop Festival (POH-Hop) was founded in 1995 by David Parks, Steven Spyryt, and emcee Cool Nutz. The vision behind it was to give artists an outlet to share their art with the larger community. POH-Hop is unique because the money generated doesn't go just to line the pockets of some event promoter; instead, the event has raised funds for community-based projects like the Black Education Center and KBOO Community Radio. Imani Muhammad also used hip hop to bring the community together when she started the Youth Summit in 2007 in memory of fourteen-year-old Davonte Lightfoot, her former student, who was killed in a gang-related shooting. The weekend gathering drew hundreds of youth who attended workshops led by local and national musicians. One of the requirements for being selected as a delegate was doing two years of service work in the United States—a breeze for an emcee who has been a community organizer almost all of his life. Deeply moved by his experiences and wanting to honor the specific requests from the African organizers he met, Crenshaw agreed to send computers to Burundi for a community computer center. As a working artist, Crenshaw didn't have the money on his own, but luckily, he had a hip hop community behind him. I just can't explain it. I actually felt like a rapper for the first time,” he says, a smile splitting his face. To that end, Zoo writes rhymes, practices his flow, and records tracks at Vursatyl's studio. They are working on a “project”—Vursatyl won't say it's an album, not yet anyway. And Zoo is okay with that. He already feels he has gotten so much out of hip hop and his interactions with Vursatyl. He says that hip hop has not only made him “ten times smarter,” but has also improved the way he feels about himself. “I can actually look in the mirror and feel like I've accomplished something,” he says. 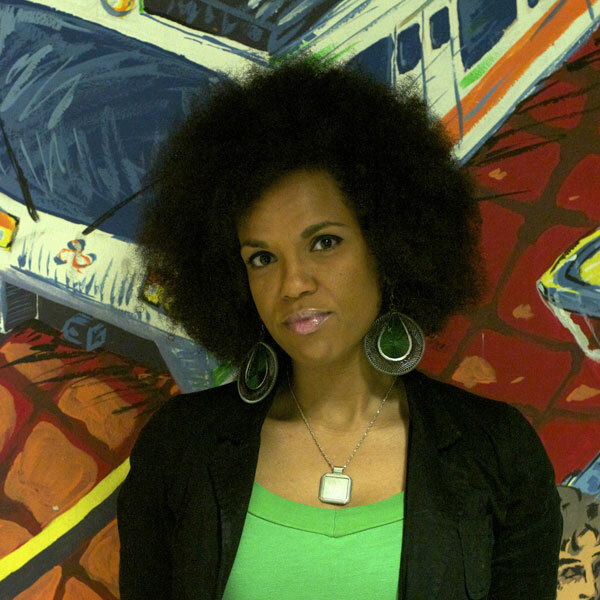 Walidah Imarisha is an educator, writer, organizer, and spoken word artist. She is the editor of two anthologies, including Octavia's Brood: Science Fiction Stories From Social Justice Movements and Another World is Possible, and the author of the poetry collection Scars/Stars. Oregon Humanities is grateful that over the past six years, she has led close to four thousand Oregonians in conversations about Oregon Black history, alternatives to incarceration, and the history of hip hop through the Conversation Project. We look forward to working with her in new ways in the future.